Enter through the Last Bookstore on 5th St. The closest parking lot is to the right of Spring Street Entrance to the building. Or take the METRO! The Pershing Square stop is just a block away. Although our official address is 453 S. Spring St., we are located insideThe Last Bookstore - enter on 5th St. through the MAIN entrance to The Last Bookstore. Come upstairs to the mezzanine level, and we're right at the top of the stairs (and just off the elevator). Explore the bookstore first on your way to the nook! Look up as you enter this historic bank turned literary emporium and you'll see our vintage sign all lit up and happy to announce that yes! there is YARN! upstairs. Call (213) 908-2656 if you have a question. See you soon! 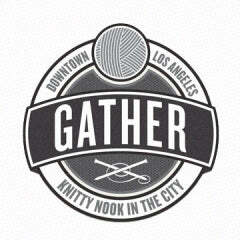 Gather DTLA brings yarn and fiber to the heart of downtown Los Angeles. Part of the Historic Core and Gallery Row we're located on the Mezzanine floor of The Last Bookstore, a 10,000 square foot historic space, originally a bank...now pure feat of the imagination, housing thousands of new and used books, records, artist studios and a vibrant community of creatives who think outside the box while staying rooted in their shared love of literature. Gather is focused on sourcing supplies for knitting, crochet, and spinning that are local, made in the US, fair-trade, and eco-friendly. You’ll find an urban oasis filled with hand-dyed, organic and unique materials and a community of talented yarnistas to help you with your fiber adventure. Whether you’re knitting a hat, looking for unusual art materials for your fiber project, or just trying to learn patience we offer classes, yarn tastings, designer workshops, and curate interesting fiber art from around the world. And of course, the shop would be nothing without the amazing individuals who help us out - our staff, our instructors, the angels and superheroes who help us behind the scenes.